DirSync Pro (Directory Synchronize Pro) is a small, but powerful utility for file and folder synchronization. 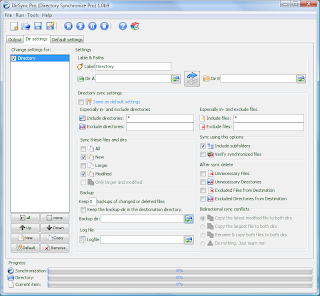 DirSync Pro can be used to synchronize the content of one or many folders recursively. Using DirSync Pro you can make incremental backups. In this way you’ll spare lots of time because you don’t have to copy all the files each time you want to update your backup; only new/modified/larger files would be copied. Use DirSync Pro to easily synchronize files from your desktop PC to your USB-stick (PDA, Notebook, …). Use this USB-stick (PDA, Notebook, …) to synchronize files to another desktop PC. Unlike many other synchronization software, DirSync Pro is Open Source; it is 100% free of charge, 100% free of commercial text, 100% free of advertisements and 100% free of spyware. You can use it as long as you like, without any limitations in time or funcationality. You can freely distribute it according to GPL3. DirSync Pro is programmed completely in platform independent Java™ so it can be run under nearly every modern operating system including Windows™, Linux™ and Macintosh™.